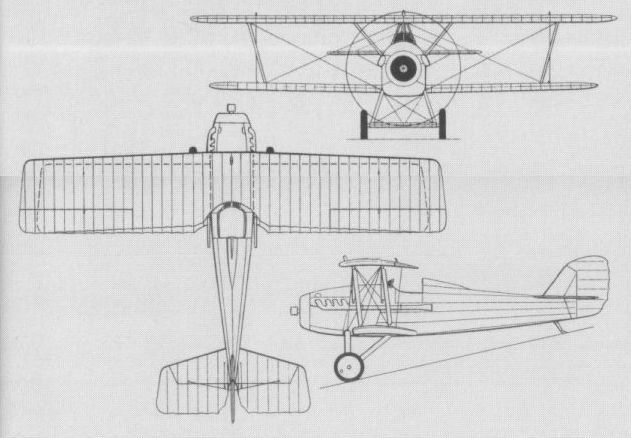 In 1919, the newly-established Hispano (later Hispano-Suiza) concern at Guadalajara built a prototype single-seat fighter to participate in the Concurso de Aviones to be held that year. The Hispano contender was designed by Eduardo Barron, who, in 1917, had supervised construction of a copy of the SPAD S.VII at the Talleres Hereter SA in Barcelona, 12 being built for the Aeronautica Militar Espanola as the Espana. The fighter designed by Barron for Hispano was a single-bay, unstaggered biplane of wooden construction with fabric skinning and powered by a 180 hp Hispano-Suiza 8Aa eight-cylinder water-cooled engine. Armament comprised a single 7,7-mm Vickers machine gun mounted above the upper wing. Flown by a Chilean pilot, Luis O'Page, the Hispano Barron was intended to compete with two indigenous fighters at Cuatro Vientos, the Hereter T.H. (Alfaro 8) and the Diaz Type C, and was declared the winning contender. The availability of proven single-seat fighters from abroad at low prices motivated against a production order, however, and only the one prototype was completed, this later being tested with a 200 hp Hispano-Suiza engine. Max speed, 1118 mph (190 km/h). Loaded weight, 1,852 lb (840 kg). Flown in 1919, the Barron-designed fighter was winner in the Concurso de Aviones.